Future apprentices, take note: There is no shortage of law students and recent graduates who would be pleased to give you their textbooks and study guides. I asked some law student to forward my email requesting book donations, and SELC’s apprentices now have enough to fill the trunk and backseat of a medium sedan. We got some real gems – a few copies of Chemerinksy’s Constitutional Law and Examples & Explanations books on a variety of topics, to name a few. We also have sets of four different publishers’ bar exam study curricula (BarPassers, Themis, Barbri, and Kaplan) and audio lectures for six bar exam topics. 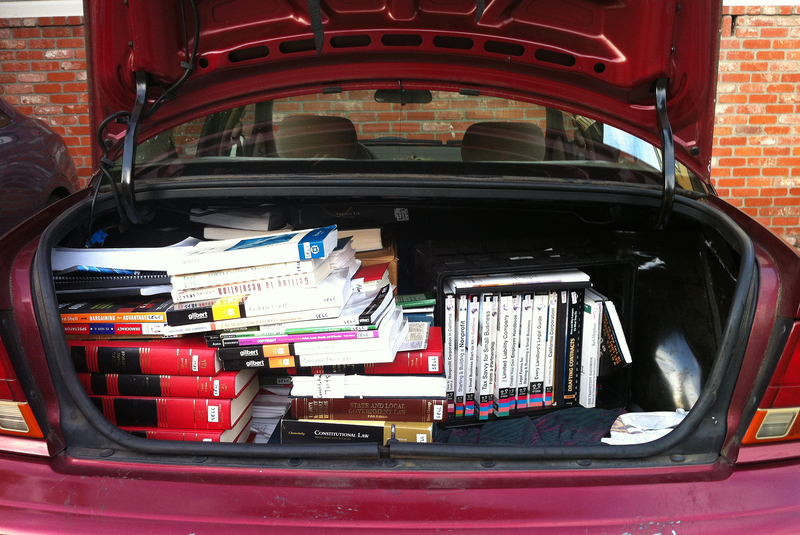 While we move offices, my car is a mobile law library. These books don’t become outdated as fast as the publishers would like us to believe they do. One benefit of learning the law outside of a law school classroom is that there is no professor requiring you to have the latest $150 edition of a particular book. Law students give these books away because the books become difficult to re-sell as soon as a new edition is released. I am reminded, however, of something Garrison Keillor said to the effect that people only lock their cars at church in July, for fear that someone might leave a basket of zucchini on their front seat. The same is true of Civil Procedure and Evidence books in the month of May, and recent law school graduates can’t seem to unload those particular topics on us fast enough. True story: Our summer intern, Imron, had his car stolen and the police later returned his car with a box of some else’s law school text books in it. See what I mean? The moral to all of this is: Until people begin apprenticing by the thousands, apprentices will likely have relatively easy and affordable access to study materials.